AGSLife is a simple AGS version of Conway's Game of Life. The "game" is a zero-player game, meaning that its evolution is determined by its initial state, requiring no further input. One interacts with the Game of Life by creating an initial configuration and observing how it evolves or, for advanced players, by creating patterns with particular properties. Features: * Save/Load patterns. * Pattern gallery, including the most common and famous patterns. 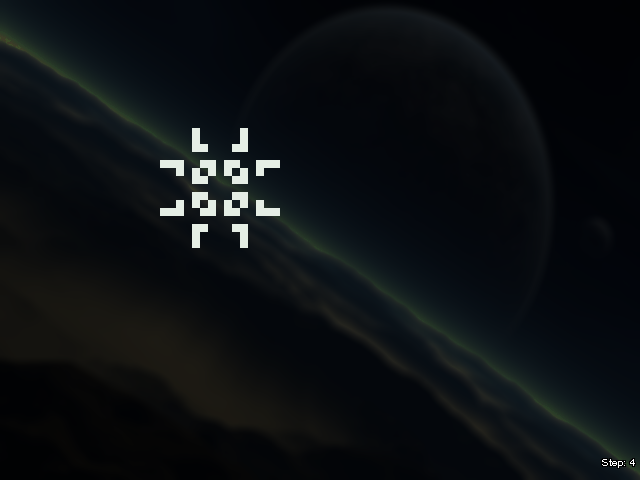 * Configurable HUD. Sort of intriguing for a while, I remember having something like this on my Atari ST many years ago. Pity the cells are all the same colour, might end up with more interesting patterns otherwise. Hard to rate really as this isn't a game, but clearly well coded. I like the pulsar and the glider, and having studied maths, I find this quite interesting, but have never really seen much on Conway's Game of Life.